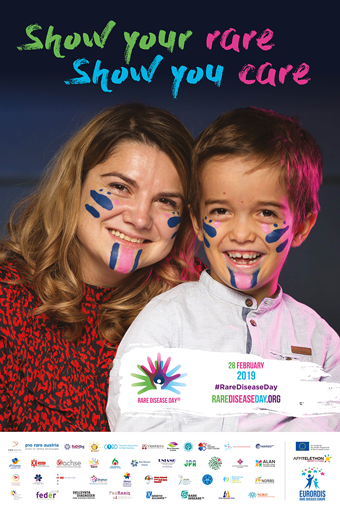 Rare Disease Day 2019 official poster is out now! For Designers: (with these files, the slogan is customisable to translate into your own language): Available in two sizes (PSD) with a 60 x 80 with a blank white space to fill in your event details. The poster features Filip who lives with achondroplasia and his mother Alina. Filip also features as one of the three patient testimonial videos filmed for this year’s campaign (coming soon!). The theme for Rare Disease Day 2019 is ‘Bridging health and social care’; this year’s campaign focuses on the need to better coordinate all aspects of care to improve the lives of people living with a rare disease. Still looking for ways to get involved on the big day? Check out all the different ways you can join in this year’s campaign! You can also download the official Rare Disease Day logo and other campaign materials to use during your Rare Disease Day activities.